It’s hard to imagine how different China was only fifty years ago. Chinese people largely dressed the same, ate the same food in cantinas and decorated their homes in similar fashion. Few brands were known, most originating from before the Japanese Occupation, the civil war and the tumultuous 50s, 60s and 70s. There were the widely available Yongjiu and Flying Pigeon bicycles — the Shanghai Watch which was worn by Mao himself — Chunghwa cigarettes — and Huili and Feiyue shoes, worn by those into sports. But people didn’t express their identity through the products they bought or owned, because everybody had the same commodities like everyone else. 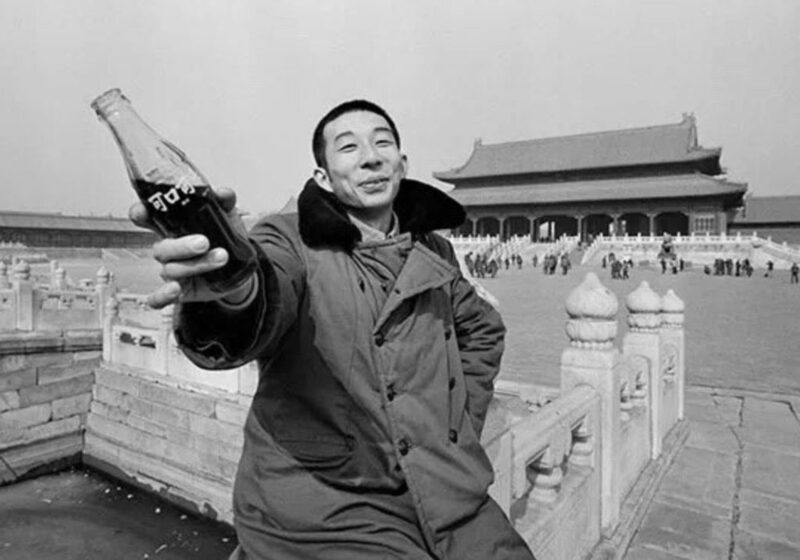 When the economic reform of 1978 opened the country to foreign brands, the consumer market was still at its infancy with consumerism being very new to China’s citizens. In fact, before then it was labelled ‘bourgeois’ to own goods or even show the desire to do so. It was taboo and politically suspicious. But the new government was eager to change this, as a tool to get the economy going. Not only did it allow foreign brands to enter China, it started to promote personal spending. Deng Xiaoping famously said that wealth is glorious, and the government highlighted models of success. 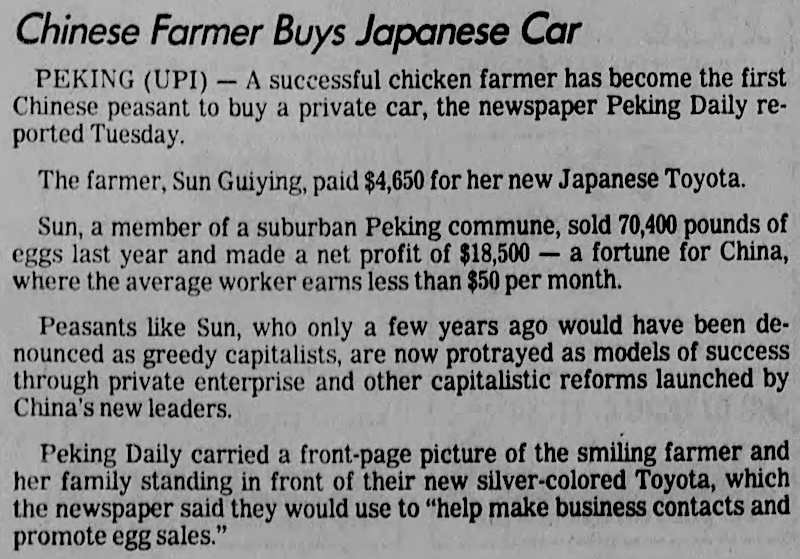 In April, 1984, the Peking Daily published a front page story about Miss Sun Guiying, a Beijing chicken farmer, who amassed a small fortune by selling eggs and used it to buy a Toyota (see photo below). 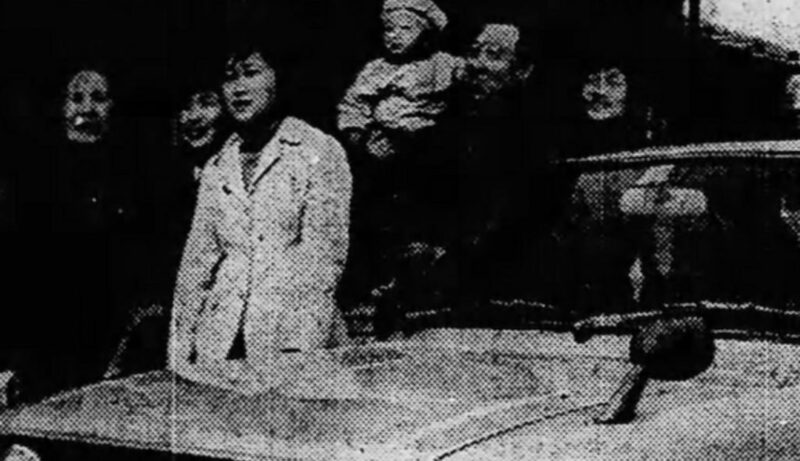 Another sign of early consumerism — which showed the newness as well as the positive energy the Chinese had — was in 1979, when China’s first foreign TV commercial aired. The one minute video that promoted the Swiss watchmaker Rado was only shown twice on the Shanghai Television channel, but still hundreds of people went to stores to ask about it, even though the watch wouldn’t sell in China for another four years. Meanwhile China held its first post-war fashion show in Beijing in 1979, by the famous French designer Pierre Cardin — and the ration coupons system, which was before then the only way of buying textiles, was abolished. A photo studio in Shanghai put up a sign for men to take photos of themselves in a European suit, and the queue was constant. At the same time, women began to curl their hair and apply make-up. During the 1980s, brands from Japan like Panasonic, Sony and Toyota, as well as Western brands like Coca Cola and KFC entered the market. Initially, foreign products were only available in designated state-owned stores, but as time went on these rules relaxed, and boardrooms across the country increasingly filled with excitement as there would be a Coke for every citizen, a television for every family, a computer in each office. 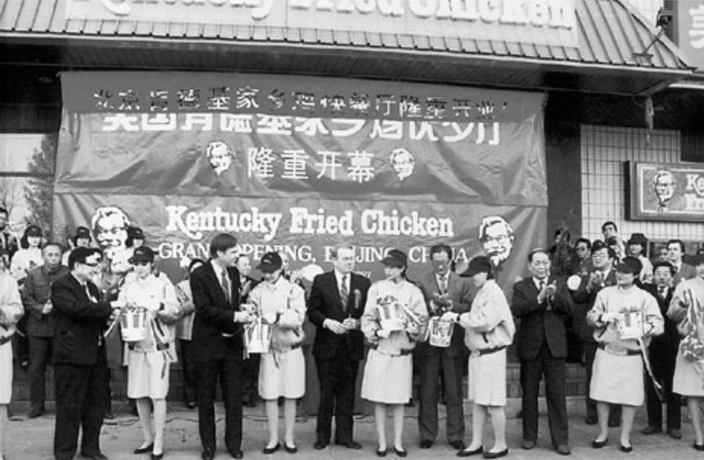 China’s first KFC, Beijing 1987. The foreign brands didn’t just bring new products to the market, they also brought changes in people’s lives. They aided the growing of individual emotions and lifestyles. Coca Cola, for instance, had to overcome China’s preference for hot drink over cold ones to get consumers to buy its ice-cold drink. And it did so partly with its TV commercials, which painted a whole different kind of life for young Chinese, which included smiling people, pop music, convertibles, and cold sugary drinks — gradually linking what one buys to ones personality. As the market matured and consumers had more and more brands to choose from, this dynamic only increased. Throughout the 1990s and 2000s, consumers where introduced to drinking coffee, cruise holidays and home decoration. IKEA entered China in 1998, when home ownership in China was relatively new. Consumers didn’t have experience with decorating their homes and didn’t feel confident in their own style choices — so IKEA took them by the hand and used its showrooms not only sell Scandinavian furniture, but also to educated Chinese consumers on how to decorate bed-, living- and bathrooms. Many advertisements are instructional almost. An ad showing a typical Chinese grandparent with a kid, holding the packaging and smiling, is saying ‘This is for family people’. There’s a Lenovo ad with a businesswoman and -man holding this laptop with glowing ‘internet’ lines, as if to say ‘This is for business people’. Harbin had this ‘cloud catcher’ commercial to explain Chinese consumers what white beer is. With consumers that are less opinionated and have a more open view than in the West, celebrities (called ‘key opinion leader’ here) are much more effective in moulding consumer’s preferences. Young consumers are eager to listen and see in them a guidance in choices that their parents never had to make. There are plenty of insane examples, such as one KOL selling 100 Mini-Coopers in 4 minutes. KOL’s not only provide a north star on social media, but also on outdoor advertising and packaging. 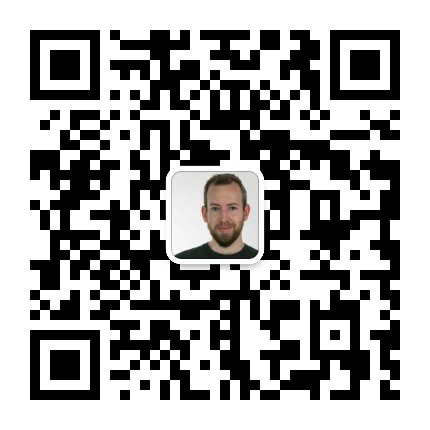 There are also channels such as Yitiao — which started as a video-content channel on WeChat four years ago, and expanded into lifestyle articles and e-commerce. To its 21 million high-income followers, it tells all about the good life and what to buy. And they now have offline stores too (photo). Perhaps Ford’s car vending machine is a gimmick, but Chinese car maker NIO sells cars straight through its app. On a Tesla fan forum a user commented: “How can you buy a car without test driving it first? This will never work” — but it’s important to be open to the nuance that a few of the things that might not work in the West, do work in China. Another example (and there are plenty of these) is Montblanc, which promoted its premium watches through a digital campaign that gave users a moon cycle reading with personality predictions, based on their personal data such as date of birth. 10 million people participated. Dior launched its new Shanghai store with a WeChat mini-game — as did Copenhagen to promote itself as a tourist location. L’Oreal (among others) has smart mirrors in its stores to let visitors virtually try on make-up, a concept SK-II takes even further. The HEMA supermarket lets users scan its products such as fresh lettuce, not only to pay for them but also to read about where and how it’s grown. 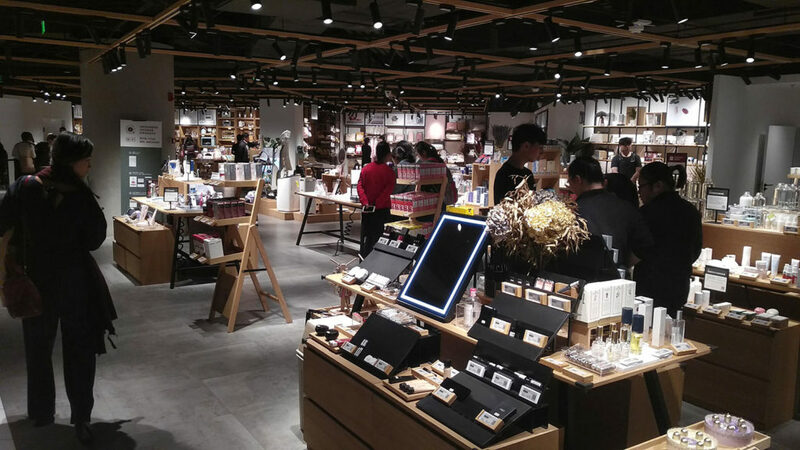 While these are, on their own, just anecdotal examples, the bigger point is that Chinese shopping experience are often a mixture of discovery and purchase, occupying the full depth of the purchase funnel. Contrary to what many Westerners think, Chinese e-commerce environments are incredibly innovative — and while Chinese consumers may be somewhat new to things like coffee and cruising, their expectations for service (delivery times, accuracy, after-sales service) are very high. And so the market is maturing fast and consumers are getting more distinct tastes. Still, some of the energy felt for the Swiss Rado commercial remains. With the increase of digital channels, brands as well as consumers have new means to further express themselves. It all makes for a rather interesting cocktail.